For all the focus on social media and the next generation of bright shiny communications technologies, the most important “digital tool” in the workforce is one of its oldest -- email. Social media, by contrast, barely even registers, according to the most recent findings from the Pew Research Center’s ongoing tracking study on the way the Internet impacts society. “The high value of email comes despite the challenges of the past generation, including threats like spam and phishing and competitors like social media and texting,” write research consultant Kristen Purcell and Pew Director of Internet, Science and Technology Research Lee Rainie in the report being released this morning. Another counterintuitive finding in the report is that landline phones outrank mobile phones among the Internet-using workers surveyed in the report. Overall, 61% of adult workers cited email as “very important” to doing their job, followed by the Internet (54%), landline phones (35%), mobile cell phones or smartphones (24%), and social networking sites like Twitter, Facebook and LinkedIn (4%). The finding is consistent with a variety of other research that has begun to come to light in the past couple of years on the misunderstood scope and influence of email as a digital communications platform, especially so-called “dark media” studies. While not explicitly targeting office workers, research conducted by 33Across’s Tynt over the past few years indicates that email is still the dominant source of social media sharing by an incredibly wide margin of four-to-one over so-called “light social” networks such as Facebook, Twitter and LinkedIn. Other researchers have corroborated those findings. Meanwhile, the Pew study also sheds light on the role that communications technologies have played and are continuing to play among employees that are not based in traditional offices, including telecommuters and part-time workers. Interestingly, all digital media play a smaller role among non-office based workers, dispelling the notion of digitally connected telecommuters. Among non-office workers, landline phones (31%) are the dominant platform, followed by mobile phones (28%), the Internet (26%), email (25%) and social networking sites (2%). On the flip side, when non-office-based workers are taken out of the equation, the role of email jumps in impo rtance to 78% of office-based employees, followed by the Internet (68%), landline phones (37%), mobile phones (22%) and social networking sites (7%). Roughly half of all employed online adults also said digital media has changed the way they work, including the number of people they have contact with (51% of respondents) and the number of hours they work (35%). The report is based on a survey of 1,066 adult Internet users conducted by GfK Sept. 12-18. 3 comments about "Email Remains Dominant Technology For Work, 'Social' Is An Also-Ran". Kevin Lee from Didit, December 30, 2014 at 10:29 a.m. The Pew Study reinforces what most marketers feel about email as a CRM touchpoint in comparison to social CRM. Email alwys wins by several orders of magnitude. Similarly, for publishers looking to build audience (more visits from existing readers/viewers) prefer email to follows/likes. Tiffany Lyman Otten from Tiffany Otten Consulting, LLC, January 1, 2015 at 6:36 p.m. I think it would be difficult to find a seasoned marketer who is surprised by this. I can't say this is insightful re: marketing tools, but it IS telling re: in-office and remote employees. I like seeing the similarity between non-office and office workers. I've been fully distributed now for approaching 5 years, and I'd honestly never go back. Some face to face IS good, but I find that the flexibility and implied trust given in telecommuting delivers better work. Plus, almost everyone in physical offices I see relies on - you guessed it, EMAIL. While people don't explicitly say so often, the CYA aspect of email is too valuable with highly-stressed (read: scattered) employees to risk important communications with a phone call - and if they DO operate over phone, they'll follow it up with an email to make sure they all had the same takeaways. There is no "I didn't agree to that!" with an email. That's why someone can be 3 cubes over, but if it's important, it's communicated by email. 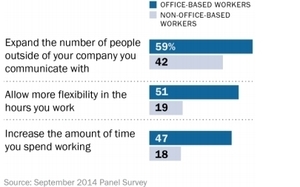 Similarly, there is no "office cooler impromptu meeting" for remote employees so of course phone use is higher. Ed Coburn from Mequoda Group, January 2, 2015 at 5:11 p.m. I often hear when talking with publishers that email is dead. I think the perception is it's dead because a) everyone says it is, and b) so many publishers do a crappy job with their email program that their results aren't good. For all of our publishing clients, who use the Mequoda Method, email is the biggest single driver of sales. As is so often the case, the ability of publishers to internalize a myth and turn it into "fact" in their own mind is impressive.